What is the PERT technique? Following the definition found in Wikipedia, "the Program (or Project) Evaluation and Review Technique is a method to analyze the involved tasks in completing a given project, especially the time needed to complete each task, and to identify the minimum time needed to complete the total project." For those who passed or are preparing for the PMP exam, you should know the famous formula to calculate the expected duration of a task. This is also known as the "three point estimate". There might be other solution(s) to do it (I don't know any so I'm open to your suggestion :)), but I will present you how to update the task duration using a macro. 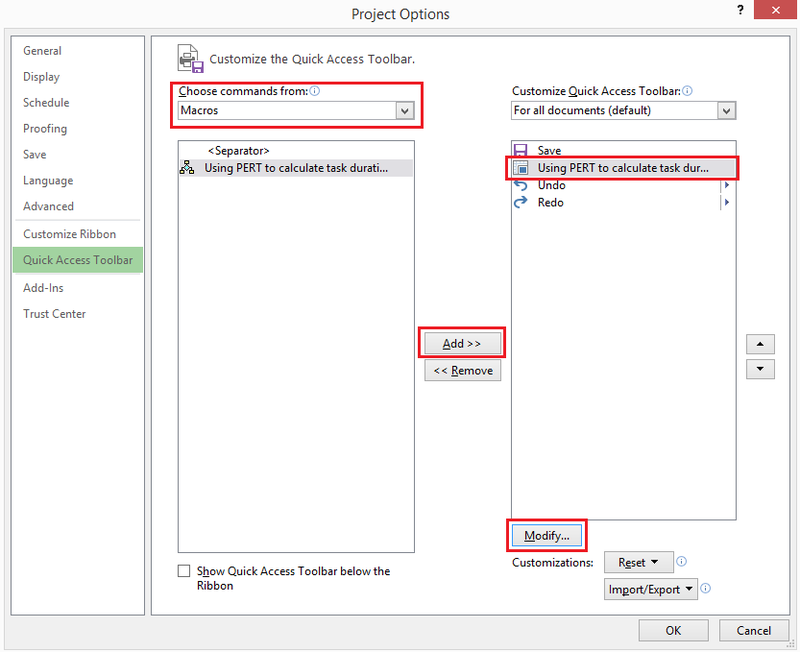 Note that you can also use the same technique to calculate task’s work (or any other task properties by the way). First of all, we will create a project plan with 3 tasks. For this demo, tasks will be manually scheduled; we don't need to link tasks neither assign resources. 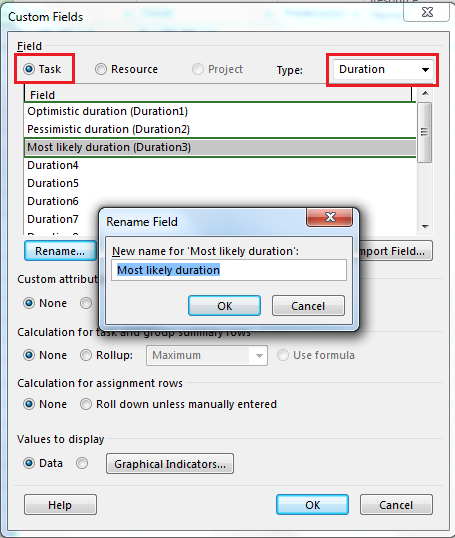 We have to create 3 Custom fields, using field "Task" and type "Duration". Right click on any column headers, and select Custom Fields. 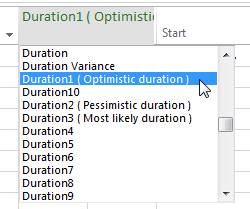 · Duration 1 = "Optimistic duration"
· Duration 2 = "Pessimistic duration"
· Duration 3 = "Most likely duration"
You now need to display the 3 fields on the Entry table, to let you input data. 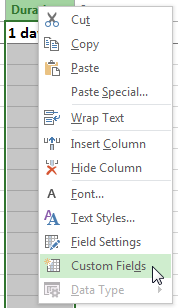 Right click on a column header and select Insert Column. Your columns can be found either under the generic name (Duration1 to Duration3) or with the updated name. To create Macro, you have to open the Visual Basic editor. Click on the View tab and under Macros, select Visual Basic. You can also press Alt + F11. On the left hand side, double click the current project "ThisProject" and paste the following code. 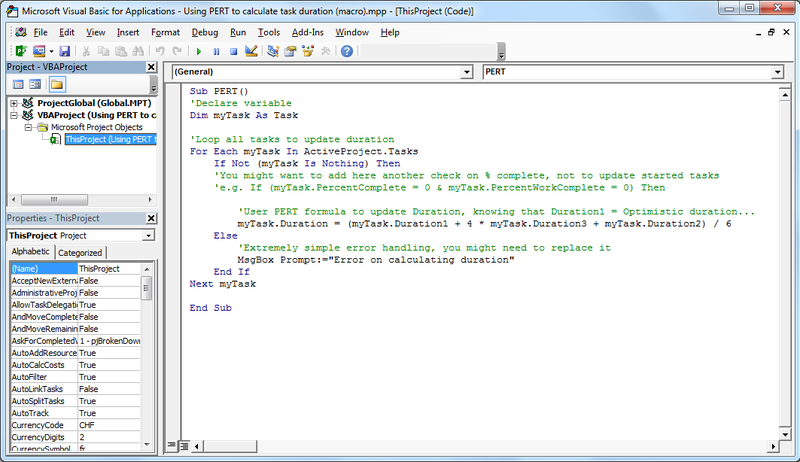 MsgBox Prompt:="Error on calculating duration"
Note that this sample code is given as information, this does not contains a proper error handling and should be reviewed before using it in production environment. You may input some values on the 3 fields for our tasks. Option 1: Using the View macro and Run. Click on the View tab and under Macros, select View Macros. You can also press Alt + F8. 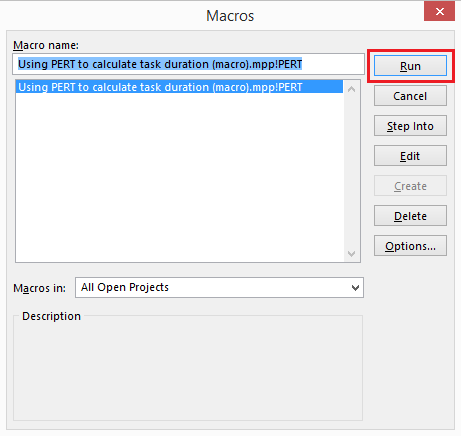 On your Macros’ list, select the PERT one (named <filename.ppt>!PERT) and click Run. On the customization screen, select Macros in the “Choose commands from” list item. You can change the icon or modify the link name by clicking on the Modify… button. 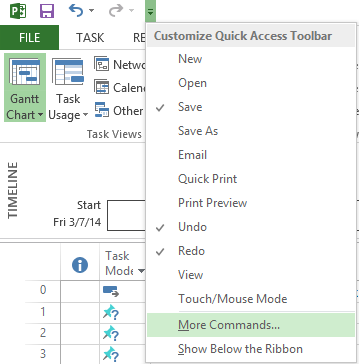 Your link appears on the Quick Access Toolbar. Click on it to play the macro and update the tasks duration. 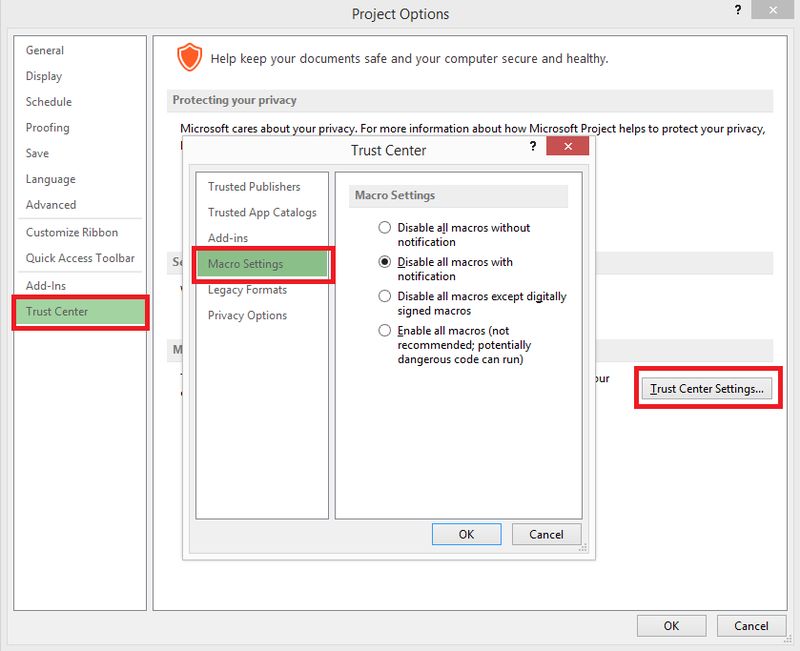 As macros are considered as potential security concern, you might see the following warning when you open your project plan. If you want to use the macro, you have to “Enable Macros”. By default, the macro settings is set to “Disable all macros with notification”; you can change this option. To digitally sign your macro, you can refer to this article Digitally sign a macro project on Microsoft website. Nice post related to itil it will certainly help for my MSP Training. It's working fine with this. Thanks Jeremy, but it doesn´t work, perhaps i´m do something wrong. When I replace the sentence and run the macro, the system throws me an error 1101. If you don´t mind, would you like to share me the script that works for you. I tried changing myTask.Duration to myTask.Work but still got the 1101 error. I'm wondering if it has something to do with the mismatch in column types (i.e. we're using duration columns to calculate a value and then plugging it into a work column). Any help would be appreciated. Very good. I made my activities in project 2013. Hi Jeremy, Wow this is awesome!! Works great and I am using MS Project 2010..